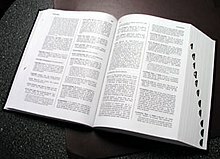 (countable) A dictionary is a book that tells you what words mean, and how to spell them. A lot of dictionaries will also tell you about etymology (where words come from) and pronunciation (how to speak them). You are reading an online dictionary right now. The words in a printed dictionary are in alphabetical order. I looked up the dictionary to find the meaning of the word business. This page was last edited on 16 September 2018, at 20:49.